Hatters caretaker boss Andy Awford has no idea just how long he will remain in temporary charge of the club. 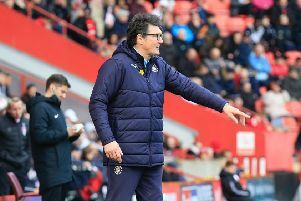 The Academy and Development manager took over when John Still was dismissed earlier this month and has led Luton for three games now, including the 0-0 draw at former club Portsmouth on Monday. “I’ll just prepare every day until I’m told differently and if someone comes in before that game with Bristol Rovers, and takes over the work we’ve done, that’s fine by me. Although Awford has confirmed he is yet to apply for the post, but would talk to club officials should they approach him about the position, Town keeper Mark Tyler admitted the squad would have no issues if he was to get the job on a full-time basis either. He said: “Andy’s been great since he’s been here. He’s changed the training a little bit, but everyone’s behind him, everyone’s together and I think it showed in how we played. “He has just freshened up a few ideas, any manager will have their own style though, but you can see that we’re playing for him, no-one’s not wanting to be here. Awford is currently 16/1 with league sponsors Sky Bet for the role, with David James the favourite ahead of Cardiff boss Russell Slade. On the market, Hatters defender Stephen O’Donnell added: “I think the odds get looked at (by players), but it’s just chit chat, nothing too serious as there’s always gossip going round. “We just keep our head down, Andy’s done a great job, whether it’s for the next couple of games, or however long, we’ve all worked hard, all bought into it.